Queues are print-in channels for acquiring SafePages. The default IPP “/” queue. After a tap on the Queues button in the main menu this panel is shown. See Section 4.2, “Menu”. All non-deleted queues are listed alphabetically by default. A different selection and sorting can be entered: see Figure 4.40, “Admin Web App: Queue - Select and Sort”. Press the New button to create and edit a new queue. The list can be traversed by tapping one of the buttons at the pager at the top or bottom of the page. The queue's trust or status (at the top right corner). The URL Path of the queue. The path is relative to the /printers URL base. An inline Line-Graph showing the day pagometers of the printed pages over the last 30 days. The full IPPS URL variant of the queue. SavaPage takes the first IPv4 address of the first network interface on the server platform as URL host. You can overrule this behavior by setting a fixed IPv4 address or DNS name in configuration item system.server.dns-name. Optionally, the allowed client IPv4 addresses as a CIDR Set. The period in which activity was accumulated on the pagometer. The pagometer of the queue including the number of jobs and bytes printed. Due to Admin Privileges certain buttons might not be visible. Queues can be selected by entering the containing text (fragment) of their URL Path. Select the queue's Trust and (Deleted) Status. The - button will select both. The list can be sorted Ascending or Descending on URL Path. Tap the Apply button to (re)display the list. 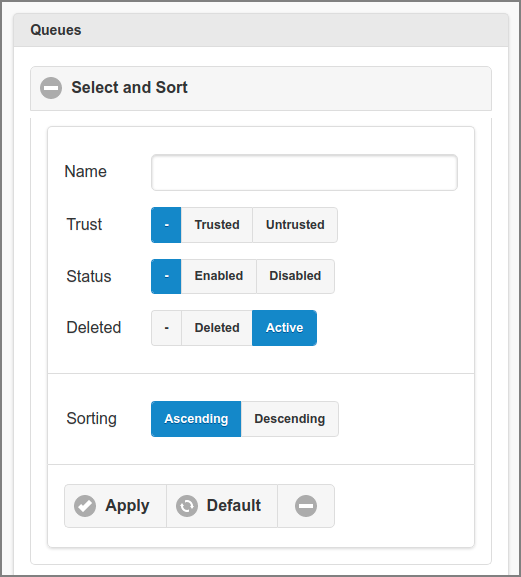 A tap on the Default button resets the selection and sort fields to their default values. The URL Path is editable. Renaming the URL path name will permanently overwrite the old name in all related job history records with the new name. Enter IPv4 address ranges as a CIDR Set at IP addresses allowed to restrict access to the queue based on requesting IP address. If the field is empty all requesting IP addresses are allowed to print to the queue. Tick the Trusted checkbox to make this a Trusted Queue. When this option is not selected the queue will be a Public Queue. Tick the Disabled checkbox to disable access to the queue for all users. Tick the Delete checkbox to delete the Queue. This will be a logical delete as long as related job history is present. Any logical deleted Queue will be physically deleted from the database when no related job history is present anymore. This situation will automatically occur when you enabled automatic backup in combination with the delete of old document logs. See Section 4.10.13, “Backups”. Press the OK button to commit the changes and return to the Queue List. The Cancel button brings you back to the Queue List without changing anything. 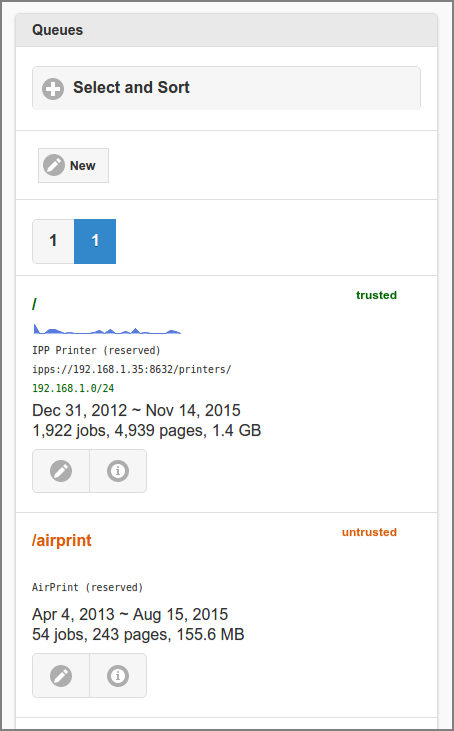 Some reserved queues like Google Cloud Print, Web Print and Mail Print can not be edited. Other reserved queues like AirPrint and Internet Print are untrusted by nature, hence the field Trusted cannot be edited.